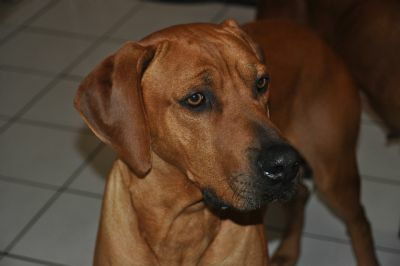 We're very thrilled and honored to have been given the opportunity to add Duke to our family. It was a dream litter with so many quality puppies, but Duke caught our eye from day 1. We love his looks, we love his pedigree, we love his movement, but best of all, we love his personality. Eveyone who meets him falls in love with him. He was a special puppy that has grown up to be a special dog. 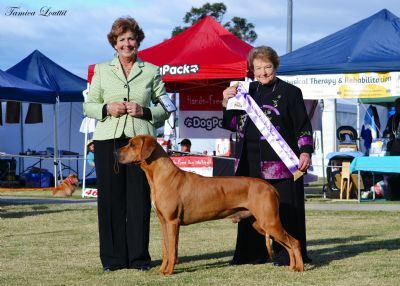 As a young dog in strong competition, including his littermates, Duke powered along in the show ring taking out Best of Breeds and Runner-Up Best of Breeds, multiple class in group awards including a Runner-Up BIS at 11 months. Duke at 11 months, had well over the required 100 points towards his title and we were thrilled when early in 2008, he gained the mandatory 25 points for his championship. Easter 2008 at Sydney Royal, Duke won Reserve Dog to his sire, Sinbad. This was repeated in 2009. June 2008 he won Reserve Dog at the Qld RR Specialty and the following day, Challenge Dog under another breed specialist. 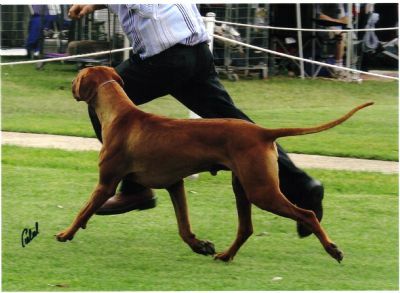 In October 2008 he won BEST IN SHOW at the RR Specialty in Sydney and repeated this in 2009. We're very proud of his 6 class wins at 6 specialties attended. Duke finished 2008 as No.2 for the breed nationally. Due to other commitments, we didn't campaign our dogs heavily in 2009 but were still pleased with Duke's consistency. He competes against our Whippet girls and is sometime beaten by them for BIG or RUBIG. May 2009 Duke wins RUNNER-UP BEST IN SHOW and a couple of weeks later, BEST IN SHOW. May also saw Duke attain his Grand Championship. He finished the year at No. 2 in the Dogzonline BOB Competition which is pretty good considering we were overseas for several weeks, had judging and family commitments. Duke is Australia's No. 1 Specialty winner with 5 BEST IN SHOW SPECIALTY plus several Reserve Challenges, he is certainly the Specialists' choice. In 2014 at 7 years of age, he won Dog CC at the Vic RR Specialty Show in May and Dog CC RUBIS at the NSW RR Specialty. He finished his show career in 2015 with an all breeds BIS and the top winning Specialty RR in Australia. A proven sire with champion progeny, he is now a much loved house pet.